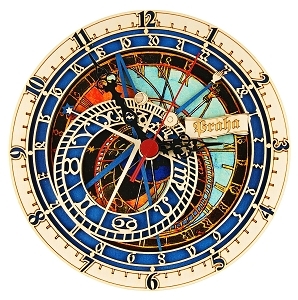 Genuine gifts, souvenirs and apparel with the Prague Astronomical Clock motive, designed and manufactured in Czechia. 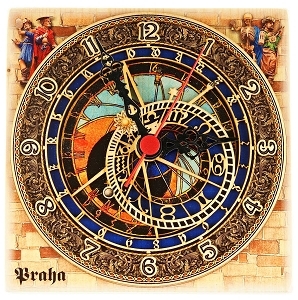 The Prague Astronomical Clock is the single most visited sight in Prague. 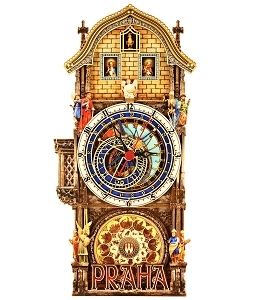 It can be found on the southern facade of the Old Town Hall tower, the major building of the Prague Old Town Square. 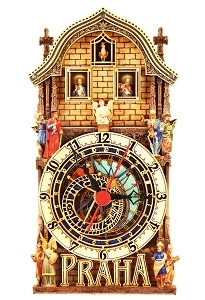 The Clock consists of three major parts: the Astronomical Dial in the middle, the balcony with windows at the top where parade of apostles shows, and the Calendar Dial at the bottom. 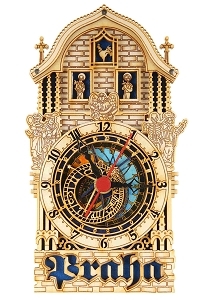 Read more about its Structure and Time Display. 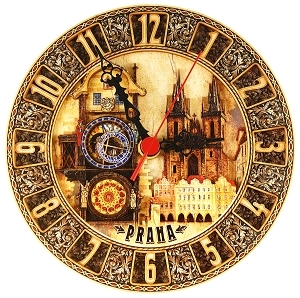 Prague Astronomical Clock is the only original medieval orloy mechanism in the world which is still in operation. 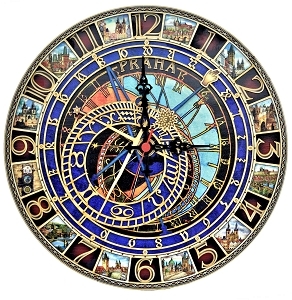 However, its most prominent tourist attraction is not the mere fact that it is the only working clock in the world which can show four different times in one dial (Old Czech Time, Central European Time, Babylonian Time and Siderian Time) but the hourly parade of the twelve Apostles in the windows above the dial section, accompanied by bell chime and presentation of other moving sculptures. 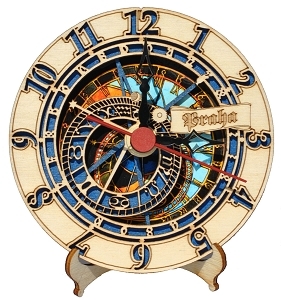 Our wooden clocks are modeling either the central part of the Clock (the Astronomical Dial), central and upper part (Astronomical Dial and the balcony with windows) or the whole Clock. 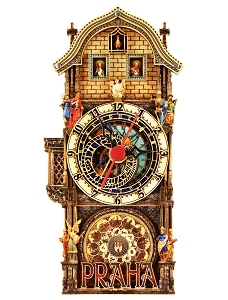 They are made of lightweight spruce wood and equipped with high quality silent electric clock engine. All models can be hung on a wall or put on a table using detachable wooden stand.